What I mean is, I have everything setup just like my old MB with the external monitor (Eizo) so it uses the same display. In addition, I just migrated all my settings and files over (and then reinstalled the apps because I didn't want all of them), so it's a virtual carbon copy of the old MB. Until I look at the MacBook Pro 6.2 display itself. The dot pitch of the new display is a lot finer than the Eizo. The Eizo is 24" and provides up to 1920x1200. The new MBP is a 15.4" matte LCD that provides up to 1680x1050. The difference in diagonal length is 8.6 inches but only 240x150 difference which is still a 23% difference in pixels compared to a 56% increase in length. I'm still not used to seeing the smaller font and part of me wishes the words were bigger. I might be getting old. Not to keep harping on the screen but the matte screen is a nice change of pace compared to the old glossy screen. Sure I don't have the nice black bezel around the display anymore but I actually kind of like the uniqueness of the silver matte screen. The MacBook Pro lettering is now black on the silver bezel. I've finally got a FireWire 800 port which means my Drobo will be transferring data at 2x the speeds of USB2.0 which was how my old MB was connecting to the Drobo. And now that I've got a "Pro" I can finally boot in the 64-bit kernel. Not that important until you feel the difference in speed of PS CS4 and Lr2. Yup, the speed was noticeable. I'm already seeing a drastic increase in speed because the processor is the 2.66GHz i7 utilizing native quad-core architecture with more L3 cache (4MB vs. 3MB L2 in the old MB). Boot times are pretty quick. Running a blur via PS provided a nice boost in speed and decrease in time spent twiddling my thumbs. I'll need to spend some more time in the 64-bit world and compare it to the 32-bit version of the same app in this computer otherwise, I might falsely attribute the speed increase to the kernel instead of the hardware. Not everything is gravy though. PS in the 32-bit kernel wasn't as graphically smooth as I thought it should have been. I have yet to test it in the 64-bit mode. Furthermore the SSD will eventually slow down as I have to erase parts of the drive to write new data. Is it the "savior" that I need? I don't know yet. As far as money saved, that it surely wasn't. 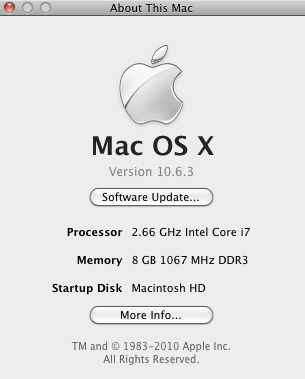 8GB RAM still doesn't quite feel like enough as I wish I could put 12GB in there. I mean with Lr and PS and Safari you can use up 8GB in a heartbeat and then need virtual memory faster than I can say "upgrade?" I need a few more days to test out the system. To be honest with you, I didn't think that I'd have much of an update on the new machine at all considering that I just got it today. But the Migration Tool/Assistant was invaluable in the move from the old MB to the new MBP and things went without a hitch... honestly, I'm kind of surprised. This stuff on PC would have taken a few days. I still have a hard time believing that I'm not writing this on my MB but instead on a new computer. How does it work? Just like an external should. It's connected as of right now via the USB2.0 port to my MacBook 5.1 which will be shortly replaced with the MacBook 6.x (not sure what code name my new MacBook is). Sometimes the drive falls asleep and takes a few seconds to spool up so that I can access the data. 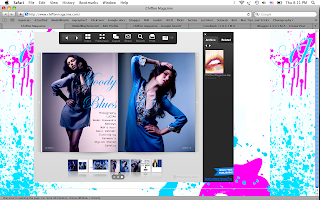 I am primarily using it for Lr archiving. That being said even when I simply use it for Lr primary data (stuff that I'm editing), it's responsive enough to be tolerable. I've had it disconnect on me only once for no reason. Otherwise, it's always connected and reliable. 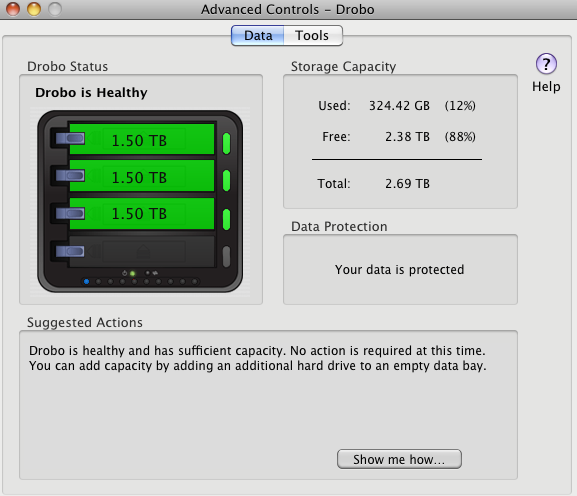 When I put the MacBook to sleep, the Drobo sleeps as well. Seeing the green lights is comforting because I know that the drive(s) are working fine. A quick Google search reveals that people used to have problems with the sleep cycle of the Drobo. Installation was a piece of cake. I mean I don't even consider that to be an installation. I simply popped 3x1.5TB drives in there physically, plugged everything in and ran 1 small program on the disk and it was ready to go. I think you can go from unboxing to file transfer in less than 5 minutes depending on how fast you can unbox stuff :) Really it was that easy. I can't remember the last time something worked so seamlessly well. As far as the complaints about not being able to eject the drive, I've been able to do it just fine directly from the desktop. I don't necessarily use the "Standby" function on the Drobo Dashboard. The Dashboard itself is a piece of software that I could probably live without but it's nice to have the little icon at the top showing me the Drobo's connected and how much space is left along with the full dashboard information when I double click it. Maybe it's not as over-rated as I think it is? A faster Internet connection. As of yesterday I replaced our 8 year old cable modem. As of last week I upgraded our Internet connection from 3Mb/s download and 256Kb/s upload to 10Mb/s download and 1Mb/s upload. Actual tests come in around 9Mb/s down and .7Mb/s up. External library. I house all my pictures on my MacBook 5.1's 500GB hard drive. But I'm finding that I have to delete stuff to make room for new pictures so I have enough virtual memory. I'm now in the process of moving my Lightroom library to a larger external library (3Tb). I'll keep the recent shoots on the computer but archive the finished shoots off-computer. I'll be backing up both this library as well as the HD on the computer. More processing power . The MacBook 5.1 is a great computer. Even at 4GB DDR3 1066MHz and 2.4GHz Dual Core. It still starts to chug when rendering Lr previews and certain blurs in Photoshop. I'm custom ordering a MacBook Pro with i7, 8GB DDR3, and 256GB SSD, . Should be at least a little faster. iPad. I'm not real sure how this thing plays into the whole infrastructure but I'm finding that it's a hugely convenient way to show pictures when I'm at the studio without bringing people to the computer. I'll be uploading pictures into iPhoto soon. What kind of talent do I look for? This was on my mind and I thought to make it the "ice-breaker" from my time away. Yes, I'm going to pretend like I've been here all along and maybe address what's going on later, but for now I want to talk about talent. Passion. If you love what you do, then you will exude passion and excitement. You will be fanatical. Passion drives what you do. Guess what? Passion is highly contagious. I love working with passionate people. Nuff said. Proactivity/Value-added. If you're passionate about what you do, you'll be proactive about facilitating the shoot and perform more than just your "task". For example, you might be a makeup artist but maybe you'll assist in styling (wardrobe) on the shoot. Another example; scheduling for me is a time-consuming task so if you can help me schedule other talents or find a model, that's being proactive. That's adding value. You're bringing more to the table than just your ability to manage the "task", whether it be wardrobe, makeup, hair or etc. Attitude. Having the right attitude is paramount. No one wants to work with a sour-puss. I've worked with some and heaven forbid that I ever have to work with those people again. Rather than going over what's wrong with people, let me tell you what's right about the people I love working with. They're upbeat, positive, excited, funny, smiling, outgoing, and keep things moving. I have enough going on in my mind during a shoot. Last thing I want to think about is whether or not I'm entertaining the talents enough or if they're happy at the shoot. Really everything I've said above is tied together one way or another. Are you all of the above? Am I all of the above? The reason this subject is relevant is because I'm debating whether to use a talent that's all of the above or to work with someone new... seems like a no-brainer but sometimes new talents provide new opportunities.